I have a 2005 navigator. (just said f-150 cuz its more common) Like the title says my A/C is stuck in defrost mode. 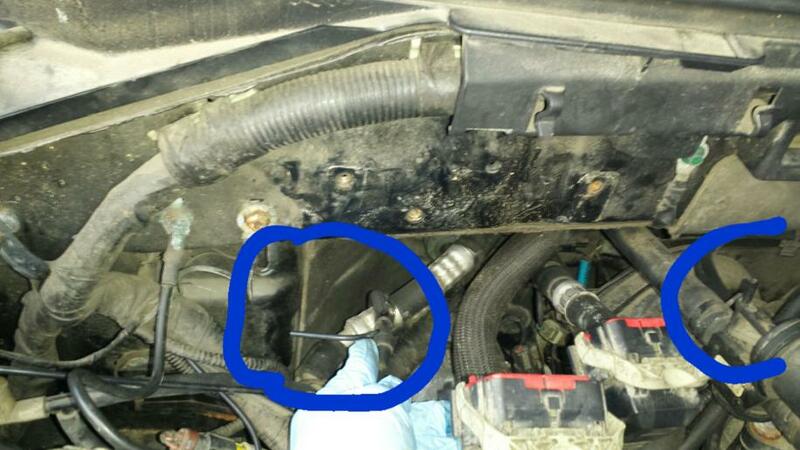 I did a good deal of searching and read the culprit may be a vacuum leak under the hood near the battery. I go under there yesterday and lo and behold I found a broken tube! *Its under my finger. I looked and looked but I cant find the other end and was hoping someone could provide a little insight. Also to the left there is a little port that looks like it should have a cap or hose on it. Does anyone know what should go there? Yes, I already tried connecting these two via a vac hose but nothing happened. I'm going out of town tomorrow if you can offer anything I'm willing to listen. Quick Reply: 2005 F-150 A/C stuck on defrost due to vac leak. Can u help identify hose?